Approximately 175 miles west of Tehran, an F-4 Phantom Fighter jet was deployed from Shahrokhi Air Force Base. 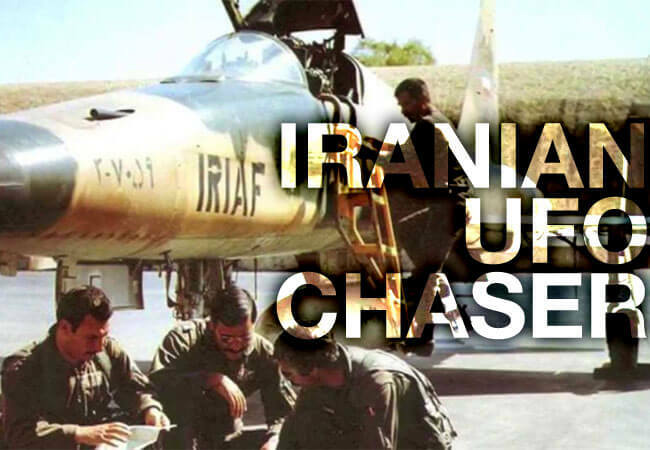 Piloted by Captain Mohammad Reza Azizkhani, the jet made it’s way towards the object. Azizkhani reported that the object was of such brilliance that it could be seen from almost 70 miles away. Whatever it was, it was very, very large. At about 25 nautical miles from the object, Azizkhani’s instruments began to malfunction. Communication capabilities were also dropped. At this point, the confused and scared pilot had no choice but to abort the interception, heading back to base. As he distanced himself from the object, his instruments began to function once again, but he didn’t want to take any chances. He headed back to base to explain what had happened to his superiors. In response to Azizkhani’s experience, a second F-4 jet was scrambled to see if it was merely the original plane that somehow malfunctioned, rather than having anything to do with the unknown object. Piloted by Lieutenant Parviz Jafari, he headed toward the object and was able to acquire a radar lock on it. Jafari would later report that the object’s radar signature was massive, comparable to that of a Boeing 707 aircraft. As he closed in on the object, it began to move. Clearly, it was aware of the interception occurring. Jafari tried to estimate the size of the object, but just like Azizkhani’s observation earlier, it was just too bright to make a fair estimate. Jafari, however, was able to make out different colored lights alternating in blinking succession. Blues, red, and orange were rapidly flashing all at once. Jafari continued south, tailing the object. That is when things got interesting. eject from the aircraft at this point, but even that had malfunctioned. He quickly turned the F-4 and made a negative G dive. The smaller object dropped behind him and followed him for a moment, making it clear that it was now in control. Jafari nervously tried to outmaneuver the object to no avail. After a few nautical miles of cat and mouse, the smaller object would eventually break off and reunite with the larger object. Jafari, making one last attempt to investigate this extremely terrifying and extraordinary encounter, witnessed one more object, cylindrical in shape, buzzing in the area. Mehrabad International Airport was notified, and responded saying that they had no aircraft in flight at the time. However, flight tower personnel were able to corroborate Jafari’s sighting of this last object, stating that it even overflow the towers, all of their electrical equipment going down for a short period of time. Soon, this object made way back to the primary object, a large flash of light occurred, and it disappeared out of sight. The following morning, the F-4 pilots went out, by helicopter, to gather any evidence of the smaller landed object. They determined that it has landed near a dry lake bed, but when they circled the area to survey, no visible evidence could be found. They did, however, receive a high amount of beeps from their helicopter meters, beeping most loudly as they approached a nearby house. They landed the helicopter and decided to question the residents to see if they had seen or experienced anything at the time of the incident. They didn’t have much to say, but did admit that a loud noise had occurred and bright light filled the area like a large burst of lightning. This would ultimately be the end of the investigation for Jafari and the other pilots, as they were specifically told to move on as if it had never occurred. Jafari, 3rd in from the left in the middle row. 2007 National Press Club Event. This didn’t stop them from going public, however, and in 2007, Jafari would stand before the National Press Club in Washington D.C., to recount his extremely detailed and unbelievable story before other very high ranked officials and military personnel. The Tehran incident garnered a lot of buzz both in the Middle East and clearly in the United States as well. Soon after the incident, a detailed four page report was recorded by the U.S. Defense Intelligence Agency and was distributed to no less than the White House, NSA, and CIA. Whatever happened in the skies that day in Tehran was a dogfight of perhaps interplanetary proportions. It was one of few cases that stretched national borders, and remains one of the most well documented and perhaps, most dangerous threats to the security of our skies.